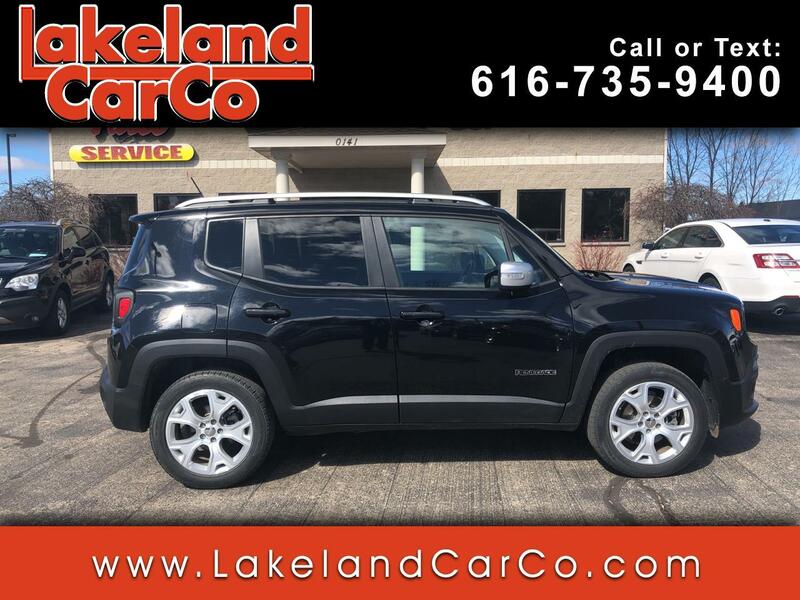 Used 2015 Jeep Renegade 4WD 4dr Limited for Sale in Grand Rapids MI 49534 Lakeland Car Co.
Boasting legendary Jeep capability, our 2015 Jeep Renegade Limited 4X4 presented in Black lets you take on those great adventures in elevated style! The 2.4 Liter 4 Cylinder offers 180hp on tap while paired with a 9 Speed Automatic transmission. You'll love the comfortable ride in our Renegade and score near 30mpg on the highway! Our Limited is sure to get attention with its aggressive stance and fun-loving character accented by classic Jeep styling. The iconic grille, deep-tint glass and tough alloy wheels let people know this machine means business! Climb inside our Limited, settle into heated leather-trimmed seats and check out the personalized instrument cluster. You'll appreciate a heated steering wheel, a rearview camera, remote vehicle starter, and a fold-forward front passenger seat. The Uconnect touchscreen is easy to operate and also provides hands-free calling with Bluetooth and voice commands, so turn on the tunes that inspire you and take on your greatest adventures!